With the help of a giant crane, the Tisbury town hall steeple was removed Saturday morning. 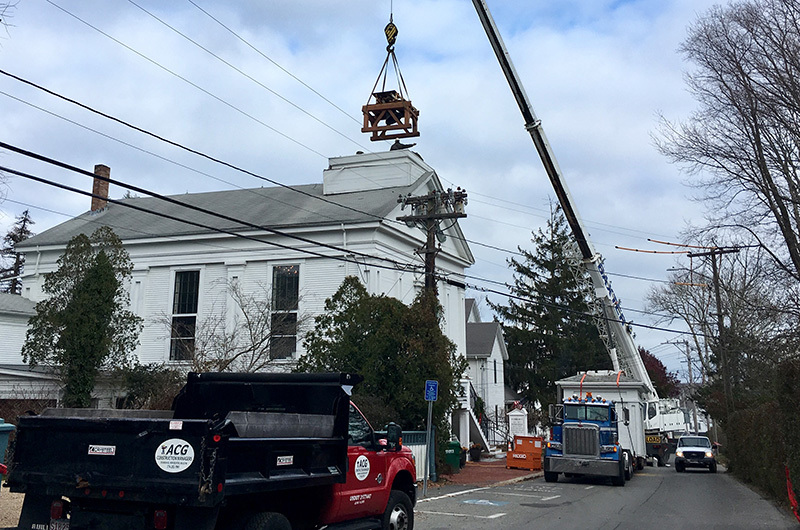 The wooden steeple and bell were removed from the Tisbury town hall on Saturday, opening a new chapter for the historic building which is due to see its top hat replaced with a lighter structure possibly made of aluminum rather than wood. Engineers identified weaknesses in the steeple structure last year. 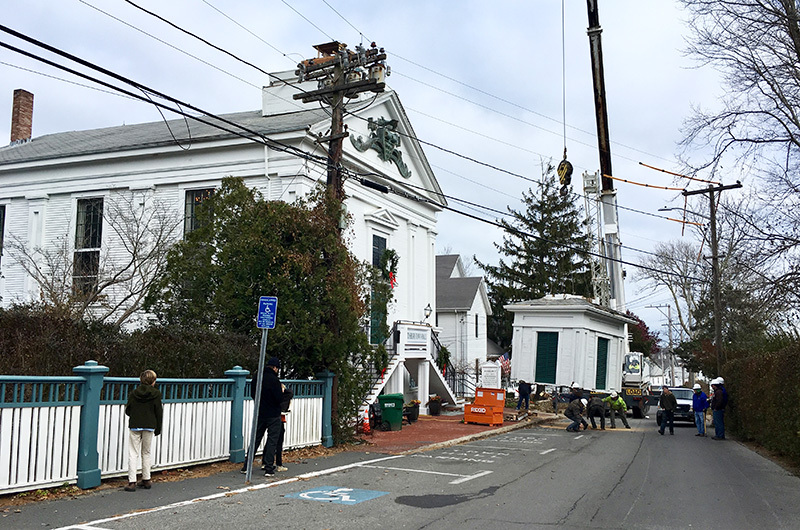 On Saturday morning Spring street was temporarily closed as an off-Island crane crew lifted the steeple off the town hall roof in four separate parts. Each was lowered onto a flatbed truck, and transported to the department of public works property for storage. As the crane began to lift the bell out of its housing, a crew member perched on the roof reached up to give the bell one last clang. Work began at about 7 a.m. and most of the steeple was down by early afternoon. The crew finished patching the roof after 5 p.m., facilities manager Kirk Metell told the Gazette. “They were finishing up the shingling in the dark,” he said. The removal operation cost about $90,000. At the annual town meeting this year the town appropriated $400,000 ($200,000 of which were Community Preservation funds) to remove the steeple and put up a new one. Mr. Metell had raised concerns that the steeple was listing and in danger of collapse. Now the town hall will lack a steeple for the winter while bids are solicited for construction of a new, lighter version. Mr. Metell said the new steeple will likely be made of aluminum, not wood, because of the difference in weight. He said the Tisbury historic commission is requiring replacement within two years, and he hopes the original bell will once again hang above the building. “It sounds wonderful, and it’ll be great to get it back in the steeple,” he said. The church was originally one story, but in the late 1800s the building was raised to create a second floor beneath the original one. The town bought the property in 1920 from retired whaling Capt. Gilbert L. Smith, who had also been a selectman.